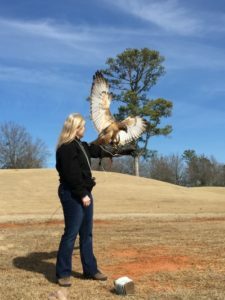 Rise enlists the help of live, non-releasable birds of prey in our programs. The purpose is to allow people to experience aspects of our world they would not be able to experience otherwise. They aid in teaching people about being good stewards of our world in fulfillment of Rise’s mission. The U.S. Migratory Bird Treaty Act of 1918 protects all migratory birds. This prohibits possession of live birds, feathers, and parts. 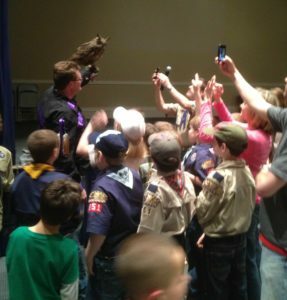 We at Rise have permits allowing the possession of live birds and static display items. Each individual is cared for with the highest standards. We use proven techniques from 4,000 years of falconry knowledge, as well as 21st century enhancements. Some of the best avian veterinarians are available to assist with physical health. We also place a high importance on mental health. Each bird is mentally challenged in a way that is specific for the individual. We work with them on free flight for both physical and mental exercise. Our training methods use only positive reinforcement. Because of many hours of preparation, our birds are comfortable around thousands of people. This allows for up close experiences with our audience members. Even though our birds are comfortable near people, they are not pets. Their primary purpose is to represent wild relatives and their world. Exploit animals for selfish personal gain. Do not abide by the laws enacted for the protection of animals. Present animals not suitable and/or properly prepared for public education programs. It is a great responsibility and privilege to be good stewards of these animals. Our commitment to them is for life. We have the utmost admiration for our wild relatives, and it is our duty to see they are treated with utmost respect and dignity. Every person working with Rise holds these standards, and will accept nothing less than the very best we can provide.